The DOW Hit 20,000, What About The DOW Hitting 100,000? DOW 20,000- What About DOW 100,000? As the DOW hits another big round number or 20,000 and people once again say that it will never go higher, I would like to present the idea of the DOW 100,000. Before you call for me to be institutionalized, let me explain a few things and dig a little deeper. You may believe in it after all. The Dow Jones Industrial Average, or DOW, is an index that tracks the value of 30 large stocks. The index was started in 1896 and has been a way that we help track the overall health of the stock market. There are many indexes now tracking various industries, sizes of companies, countries or regions. The DOW was the first and is definitely the most well-known. 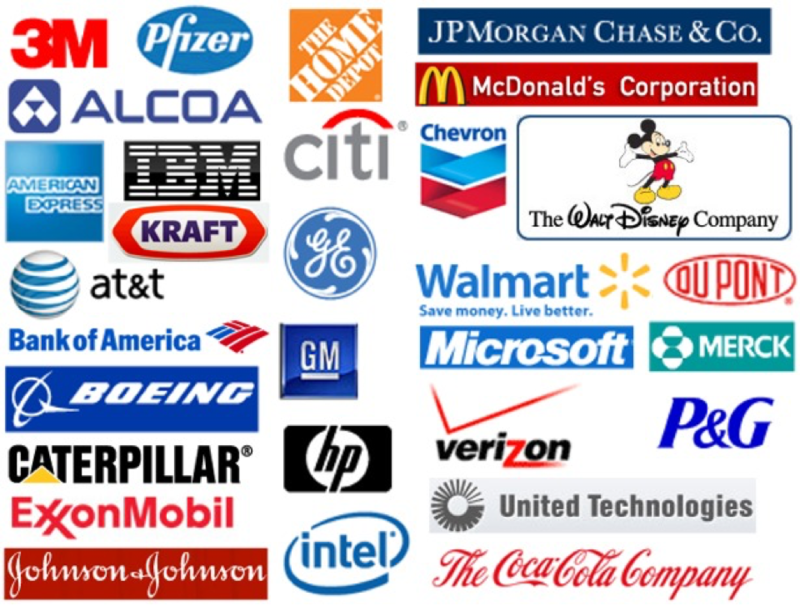 Currently, the DOW is made up of the companies in the chart below. Some of you remember the day the DOW hit 1000 back in November of 1972. Many people claimed that it could not go higher and that everyone should just take their profits and go home. The stock market did in fact decline and not pass the 1000 level again until November when Reagan was elected. The bear market during that time saw the Dow drop 40% with issues with Oil being one of the main factors. More of you remember when the DOW hit 10,000. This was back in March of 1999. This was a big moment as the DOW added a new digit. Once again, a retreat was seen with the tech bubble bursting. 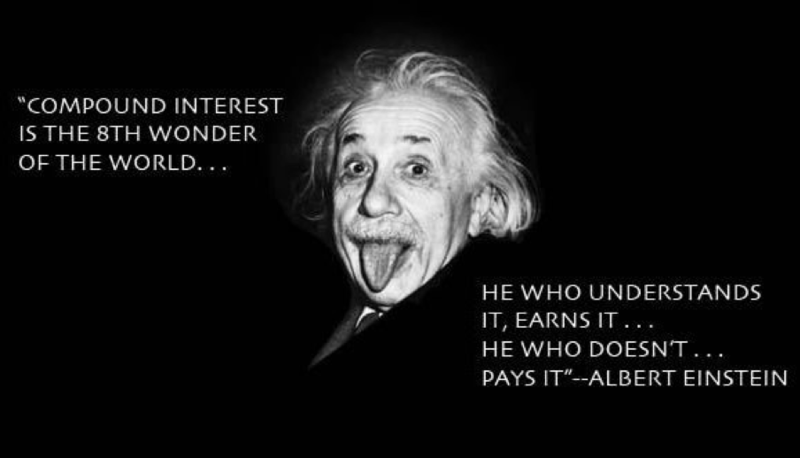 Albert Einstein Famously stated “Compounding is the eighth wonder of the world.” I agree with him. I want to remind you of a trick that I use all the time to get your heads around this eighth wonder of the world. I like to use a trick called “The Rule of 72” that most of you likely learned in middle school and promptly forgot. The graphic below shows how it works. You take the number 72, divide it by the annual rate of return (as an example, if it is 9%, you would divide it by 9) and you get the number of years it would take for your money to double (in the example, it would take 8 years for your money to double if you were to have a return of 9%). If you have been calculating as we have gone through you probably already have come to the conclusion that the DOW reaching 100,000 is a distinct reality. While there are no guarantees with the stock market and it definitely does not follow a straight line, we can look at the past returns to see what could happen. I looked at the average percentage of growth over the past 30 years from January 1, 1987 when the DOW closed at 2158.04 to January 1, 2017 when the DOW closed at 19826.77. Taking those numbers, the DOW has returned a compounded annual rate of return of 7.67%. If we take that number and use that as a hypothetical return over the next 30 years using the rule of 72, we could see the DOW crossing the 100,000 mark in the year 2039. Now this is all hypothetical and not investment advice, more an exercise in understanding where we have been with the DOW and the wonder of compounding interest. 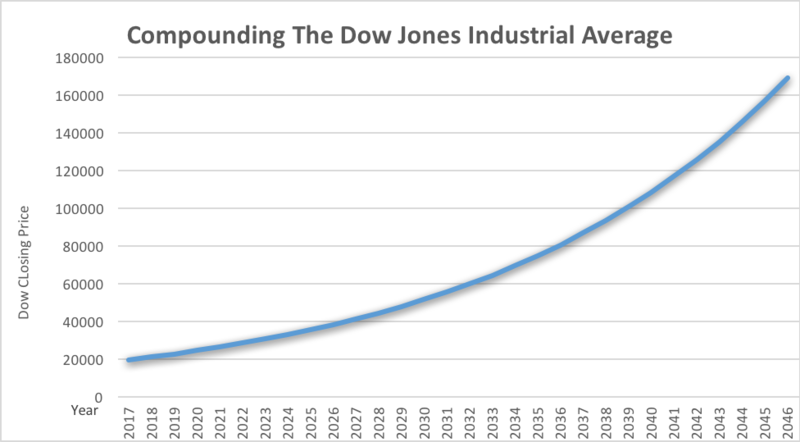 Next time your friend tells you that the DOW will never go higher, you can help teach them the power of compounding and blow their minds with this simple exercise. You can also use it with your own financial situation. You can also go to my website www.mattloganinc.com for more information on financial topics you may find helpful. Matt Logan is a Representative with Matt Logan Inc and Summit Brokerage and may be reached at www.mattloganinc.com, 336-540-9700 or [email protected]. Disclosure: DOW is an unmanaged group of securities considered to be representative of the stock market in general. It is not possible to invest directly in an index.